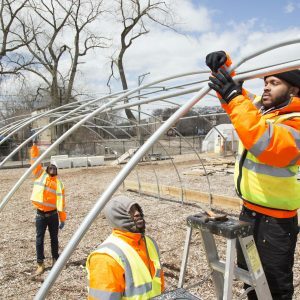 CHICAGO – June 8, 2018 – READI Chicago (Rapid Employment And Development Initiative) is an innovative response to reduce gun violence that connects people most at risk of gun violence involvement with paid transitional jobs, cognitive behavioral therapy and supportive services to create viable pathways to a different future. Launched in the fall of 2017 with a goal of reaching 500 men, the program reaches across four community areas including North Lawndale, Austin, West Garfield Park and Greater Englewood. READI Chicago is a two-year program in which participants engage in 18-months of paid employment, cognitive behavioral therapy, coaching and skill building, and supportive services. During employment, participants work approximately 25 hours and spend approximately 15 hours receiving coaching and services each week. At the conclusion of the 18-month employment period, participants will continue for six months of case management and coaching as they transition to stable, unsubsidized employment. The majority of participants have been disconnected from services and have little to no traditional work histories. READI Chicago outreach workers, who have similar backgrounds and experiences, practice relentless engagement to encourage participants to stay the course and to build new relationships with potential participants. READI Chicago is being implemented through seven partner organizations, including: Institute for Nonviolence Chicago, UCAN, Lawndale Christian Legal Center, Cure Violence, Heartland Human Care Services, North Lawndale Employment Network, and Centers for New Horizons. The University of Chicago Crime and Poverty Labs are conducting a rigorous evaluation of READI Chicago in order to understand its impact and potential. The program’s first year is being funded through $16 million donated by JPMorgan Chase & Co., The Boeing Company, and a group of philanthropic leaders including: Paul M. Angell Family Foundation, The Crown Family, Frechette Family Foundation, Lloyd A. Fry Foundation, Illinois Criminal Justice Information Authority, John D. and Catherine T. MacArthur Foundation, Partnership for Safe and Peaceful Communities, Polk Bros. Foundation, and The Harry and Jeanette Weinberg Foundation. Click here to learn more about READI Chicago.